SEATTLE – Today, H-2A farmworkers who picked blueberries at Sarbanand Farms in Sumas, Washington last year filed an employment rights class action against Sarbanand and its parent company, Munger Bros., alleging violations of the federal Trafficking Victims Protection Act (TVPA) through a pattern of threats and intimidation that caused its H-2A workforce to believe they would suffer serious harm unless they fully submitted to the company’s labor demands. The lawsuit alleges that when the H-2A workers arrived at Sarbanand in July, a top management official informed them they had to be in the field working every day “unless they were on their death bed.” An H-2A farmworker employed at Sarbanand, Honesto Silva, died in August after being taken away from the labor camp in an ambulance and causing grave concerns from remaining workers about Sarbanand’s commitment to worker health and safety. In addition to the TVPA claims, the suit alleges this same pattern also violated the Washington Law Against Discrimination because it created a hostile work environment based on the H-2A workers’ national origin and violated their right to be free from discrimination in employment. 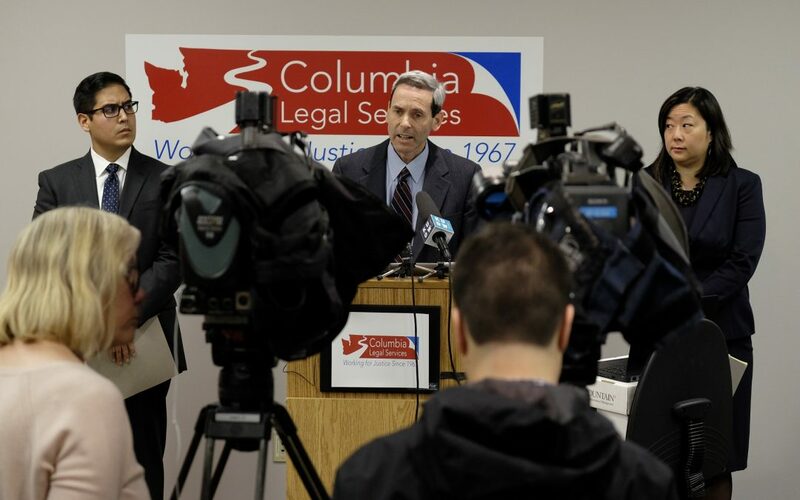 The workers also sued Munger’s unlicensed farm labor contractor, CSI Visa Processing, for failing to comply with the Washington Farm Labor Contractor Act. H-2A farmworkers are the most vulnerable field workers in the United States as they are exempt from the primary federal law that protects all other farmworkers, even undocumented farmworkers. They also are highly susceptible to retaliation as labor recruiters in foreign countries routinely blacklist H-2A workers who try to improve their working conditions. H-2A farmworkers come from rural, impoverished villages and are often heavily indebted when they enter the United States. Their work visas bind them to one employer with no freedom to seek other employment if working conditions are substandard. Therefore, their only choice is to keep working or go back to their home country. Columbia Legal Services and Schroeter Goldmark & Bender filed the suit in federal court on behalf of Barbaro Rosas and Guadalupe Tapia, two H-2A agricultural workers who worked at Sarbanand Farms in 2017 and were fired and summarily evicted from their housing after a one-day strike to improve working conditions. Scores of H-2A workers went on strike in August when their fellow co-worker, Honesto Silva, was taken by ambulance to the hospital and eventually died. One day after the strike, the company called all striking workers together, fired them, and gave them one hour to pack their bags and leave under threat to call the police and immigration authorities. Munger, based in Delano, California, is reported to be the largest producer of fresh blueberries in the world with more than 3,000 acres in Washington, Oregon, California, British Columbia, and Mexico. Munger is owned by two brothers, Kewel (who goes by “Kable”) & Baldev (who uses the name “David”) Munger. The workers also claim the company charged every single H-2A worker $12 a day for three meals a day, yet provided them with measly portions and threatened to fire workers who asked for more food. Sarbanand forced the workers to stand in line and have a “X” put on their hand with a marker to ensure they only had one portion. The complaint also alleges the company served undercooked meat and banned workers from bringing their own food into the fields. Over 600 farmworkers could be members of this proposed class action because the orchestrated firing and eviction sent a message to all H-2A blueberry workers that they needed to keep working and they should never join together to improve working conditions. The case asks the court to award monetary damages and injunctive relief to the Plaintiffs and other members of the class. The case will first need to be approved as a class action which should happen over the coming months. See, “Close to Slavery” 2013 Southern Poverty Law Center report found at: https://www.splcenter.org/20130218/close-slavery-guestworker-programs-united-states; “No Way to Treat a Guest: Why the H-2A Agricultural Visa Program Fails U.S. and Foreign Workers, Farmworker Justice Fund, https://www.farmworkerjustice.org/sites/default/files/documents/7.2.a.6%20fwj.pdf.